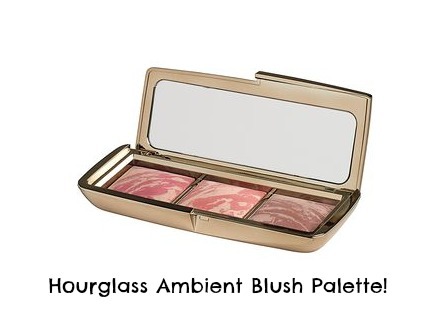 Hourglass Ambient Blush Palette is available for pre order on SpaceNK! Discount code too! What better way to start a Friday than to get a tweet from your bloggy chum DollyRouge to let you know that the Hourglass Ambient Blush Palette is available to pre order on the SpaceNK website! So I did it.... Spending ban terms and conditions stated (in my mind) that when this was available, I'd be buying it and I big fat did! And here's the clincher - SpaceNK are giving us £10 off when we spend £40 or more, so this ended up being £46 instead of £56. Baaaaarrrrrggggaaaaaaaiiiinnnn! I believe that we are going to be very happy together. This will ship on November 1st, but I'm hoping it might ship a bit earlier as that's what happened when I ordered the ambient lighting powder last year. I use my Ambient Blush in Dim Infusion nearly every day and have to force myself to use something else, such is the love I have for it, so I know 100% I'll get a lot of use out of this palette and sure I'd wanted Mood Exposure anyway. And come on, look at that middle shade, is it not meant for me and all it's peachy corally goodness? Yes, this will sell out once it launches, so be quick and pick it up here! The code DISCOVER10 only lasts until this Tuesday the 14th of October at midnight, so decide quickly!